The Trump administration’s decision to suspend U.S. participation in the Intermediate-Range Nuclear Forces Treaty and start a six-month process to withdraw from the landmark arms-control pact with Russia – formally announced Feb. 1 but previewed by President Trump during an election campaign rally last October – has drawn quick responses from nuclear disarmament advocates, and from members of Congress. 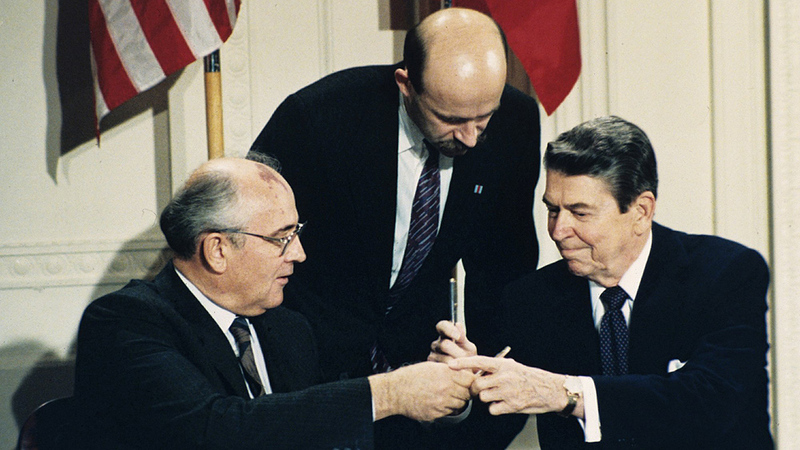 The 1987 agreement signed by President Reagan and Soviet leader Mikhail Gorbachev defused a rapidly escalating Cold War crisis over the two countries’ growing deployments of land-based, nuclear-capable missiles in Europe, with the U.S. stationing missiles in countries including then-West Germany, and the USSR deploying them within its own borders. Because their flight times could be as short as 10 minutes, the missiles were considered a possible hair-trigger for nuclear war. The INF treaty bars land-based missiles with ranges between 311 and 3,420 miles but doesn’t cover air- or sea-launched missiles with similar ranges. 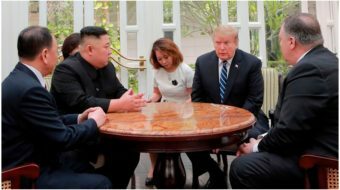 After it was signed the two countries destroyed nearly 2,700 missiles, and several other European countries, though they were not part of the pact, also scrapped their midrange land-based missiles. The agreement has been seen as a landmark in the decades of struggle to achieve complete and verifiable nuclear disarmament. U.S. Secretary of State Mike Pompeo said his Feb. 1 announcement marks the start of a six-month process to withdraw if Russia doesn’t eliminate a ground-launched missile Washington claims can fly beyond the treaty’s limit. The Russians, in turn, contend they have not violated the agreement. On Feb. 2, Russian President Vladimir Putin responded to the U.S. action by announcing that his country, too, would suspend observance of the INF Treaty, and would now design and build weapons the pact outlawed, but would not deploy them unless the U.S. did so first. “Unfortunately, this is only the latest turn in a procession of erratic and short-sighted nuclear policy shifts that make our nation and the world less safe,” he said, citing U.S. withdrawal from the Iran nuclear agreement, ratcheting up nuclear weapons spending and listing new scenarios in which the U.S. might use nuclear arms. 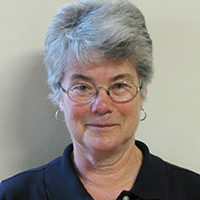 Noting that the INF Treaty was the “first nuclear agreement to ever outlaw an entire class of weapons,” Rachel Bronson, president of the Bulletin of the Atomic Scientists, pointed out that the U.S. National Nuclear Security Administration has just announced it will start producing a new low-yield nuclear weapon, “about one-third as powerful as the bomb used on Hiroshima.” The new bombs, which some say are “small enough to use,” could be ready by the end of this year. Bronson cited Congressional Budget Office figures showing costs for nuclear upgrades over the next 10 years projected to soar to $494 billion. Such concerns have been growing since the Trump administration earlier this year revealed its new Nuclear Posture Review, which projected development of new submarine-launched warheads including the W76-2, a lower yield warhead to sit on Trident missiles. Meanwhile, during the first weeks of the new Congress, members of the House and Senate have been active around preserving the INF Treaty and related issues. Oregon Sen. Jeff Merkley and nine other senators – all Democrats except Independent Sen. Bernie Sanders – on Jan. 31 announced the introduction of the Prevention of Arms Race Act of 2019, which would bar funding for development, testing or deploying a U.S. missile in the range covered by the INF Treaty, until the Trump administration meets conditions including reporting “recent diplomatic efforts to bring Russia back into compliance with the Treaty,” and identifying what INF-compliant weapons could fulfill U.S. needs. 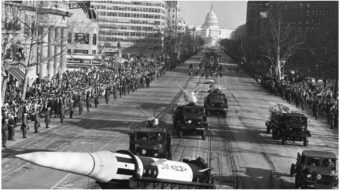 On Jan. 30, Rep. Adam Smith, the new chair of the House Armed Services Committee, and Sen. Elizabeth Warren – both Democrats – introduced the No First Use Act, declaring it U.S. policy not to use nuclear weapons except in response to a nuclear attack. And in the third week of January, Rep. Ted Lieu, a California Democrat, joined Rep. Smith and Massachusetts Sen. Ed Markey in reintroducing the Hold the Low-Yield Nuclear Explosive (Hold the LYNE) Act, a bill to prevent deployment of the W76-2 warhead.